When Barkley announced his return for his senior season, he became the leader of the race for the Heisman. Lane Kiffin will have him throwing 30 to 40 times a game thanks to the wide outs he has. Against lackluster secondaries in the Pac 12, Barkley should rack up yards and touchdowns. 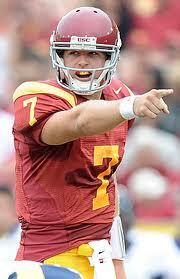 He'll have the best Trojan quarterback season since Matt Leinart won the Heisman. Winning a championship would certainly help Barkley and he must have strong games against Oregon and Utah in order to gain national exposure. 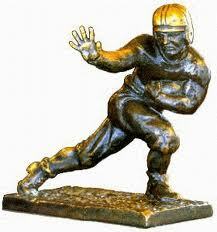 Though, if Barkley stays healthy he'll have a big oppurtunity to bring home the Heisman for USC. It will be certainly be tough to replicate Ball's 2011 but anything close to that should make him a finalist. Ball may not be healthy to start after the brutal beating he took this offseason but he has the talent to make up for it even if he plays less games. The Badgers should run and run due to the fact they are breaking in a new quarterback this season. Like every Heisman contender success should help Ball and the Badgers could have a lot of it. Robinson is the most explosive player in the nation but unfortunately that doesn't gurantee him a Heisman. Over the past two seasons the thing that has kept Robinson from a Heisman is his passing game. That could be an issue this year also as he loses a lot of quality targets from last season. Though Brady Hoke says he has improved in that area and shouldn't we believe him? 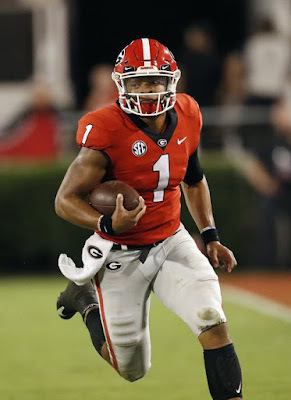 Another BCS bowl win would definitely help his stock and so would a strong outing the first week against a tough Alabama team. If you're wondering what a PM is crack open a dictionary and you'll see Thomas' face as he defines the term playmaker. Thomas can catch, run and is a beast in the return game for a team that realistically could win a BCS title. The X-factor for him is to get the right amount of touches. Too many could hurt his stock and too little could have the same effect. But Chip Kelly is a smart man and with Thomas' talent you could see him as a finalist. Yeah, I know this is a little bit of a stretch. Thomas had a strong first season as starter but putting him in the middle of a Heisman race may be a little bit crazy. But Thomas reminds me firmly of Cam Newton and Robert Griffin, who in case you have had your head buried in sand, have won the past two trophies. Thomas has great size with a huge arm and is a threat to run the football also. 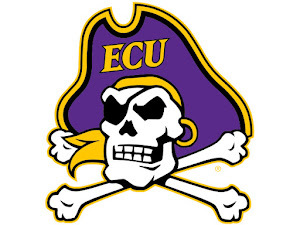 Frank Beamer should pass the ball more with an experienced talent like him under center which will help. It will take a lot, but Thomas has the talent to be on this list. Geno Smith, QB, West Virginia Huge arm, pass-happy offense. Easily gets on this list. Robert Woods, WR, USC Cue the Brandon Weeden-Justin Blackmon montage. Marcus Lattimore, RB, South Carolina If he can stay healthy he could be a lock. Landry Jones, QB, Oklahoma Will he the be the quarterback of the 2011 first half or second half? David Amerson, DB, NC State No Tyrann Mathieu so I have to put some defender.